Dr. W. Robert Godfrey is president and professor of church history at Westminster Seminary California. He is a visiting professor in the doctor of ministry program at the Ligonier Academy of Biblical and Theological Studies. His many books include God’s Pattern for Creation, Reformation Sketches, and An Unexpected Journey. The ascension of Christ marks the pinnacle of His earthly ministry, yet it is one of the most underappreciated aspects of His work. Jesus said it would be to our advantage for Him to return to His heavenly Father. From His exalted position at the right hand of the Father, Christ poured out the Holy Spirit upon His people. 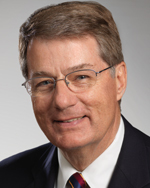 In this session, Dr. W. Robert Godfrey will explain the ascension of Christ in connection with the work of the Holy Spirit and the ministry of the local church. While you’re waiting for June, you can look back in the archives and find all of Dr. W. Robert Godfrey’s conference messages here. For example, here’s a message from the 2016 National Conference in which Dr. W. Robert Godfrey reflects upon current cultural challenges to a biblical worldview in light of God’s design for creation. Use #ligcon and let us know you’re coming. We hope to see you in Seattle next among among those already registered who will gather for teaching, worship, prayer, and fellowship. Final opportunity to register and save $20.